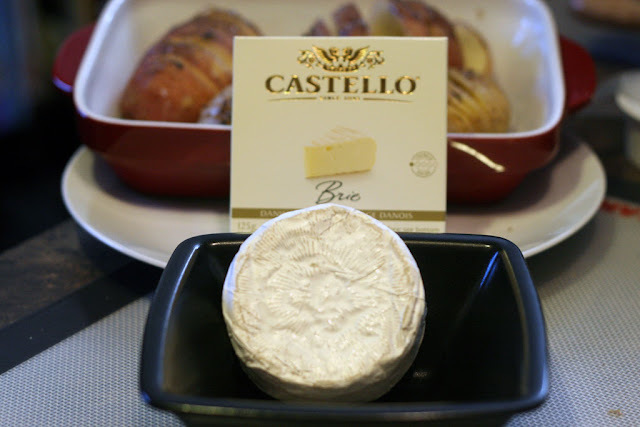 Disclaimer: For the upcoming movie - Burnt starring Bradley Cooper, Castello® asked me to come up with a recipe using one of their cheeses. I received a package in order to inspire me to develop a recipe and Castello has offered readers of my blog a prize pack (keep reading to find out more!). This recipe does not hinge on only using Castello cheese, you can use any cheese you like. Dan and I have been wanting to make this style of potatoes for a while! I love how they look and more importantly how crispy each slice is after they have been baked in the oven. Having bits of melty cheese on each slice is a huge bonus too! I hope you enjoy them as much as I do. Try not to burn your fingers on them as they come out of the oven sizzling with melted cheese! Wash and dry 4 potatoes. Do not peel as the skin adds flavour. 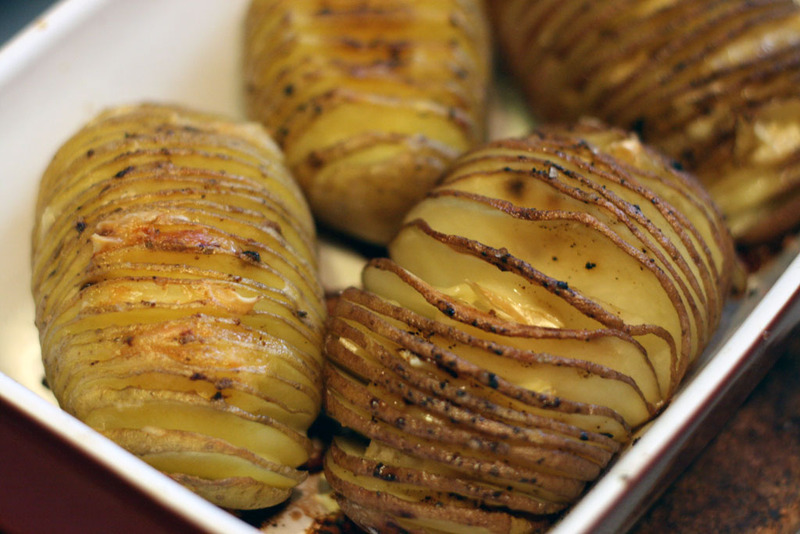 Rub olive oil over the skin of the potatoes. 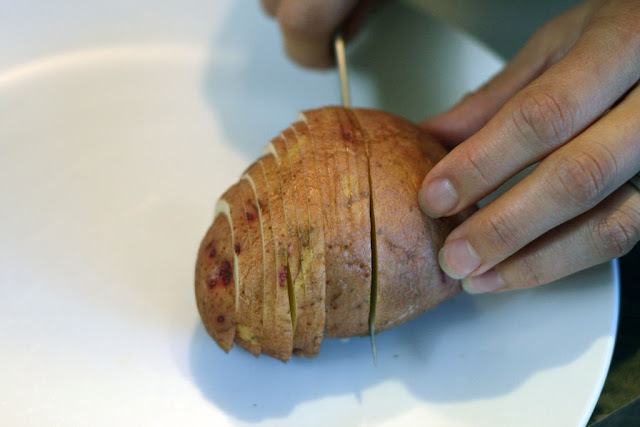 Using a knife make thin vertical slits 3/4 of the way down the potato (don't cut all the way through the potato). Try to cut as thin as possible. Use the same method on all the potatoes. Slice the cheese you want to use for your hasselback potatoes. In this particular version of the recipe I used Castello's Brie cheese; approximately half the circle cut into pieces. 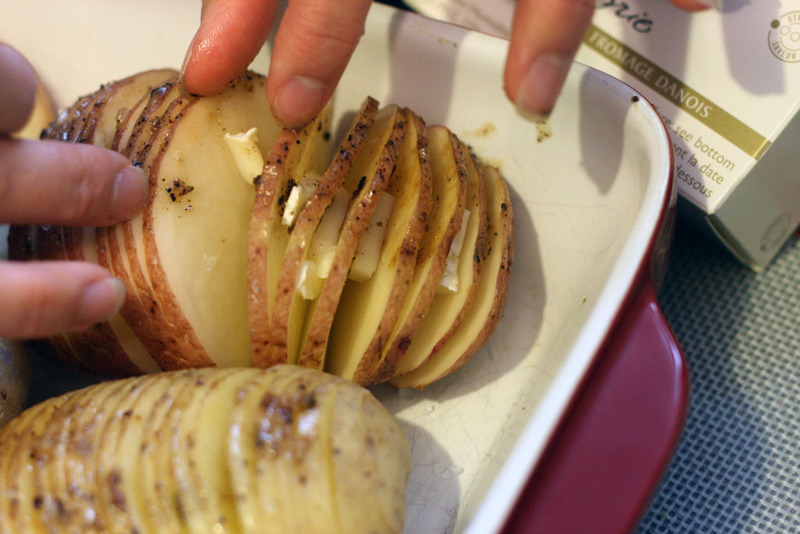 Insert pieces of cheese into each slice of potato. The potatoes will start to accordion out. After inserting cheese into every potato, drizzle more olive oil onto the potatoes. Add salt and pepper to taste. Bake at 400F for 45 minutes in an oven proof dish. These hasselback potatoes make an excellent addition to any meal as a side or even as a main dish. Experiment with different cheeses and potatoes to see what works best for your family and palate. For our testings, we used two different potatoes for this recipe. One was the Colomba potato and the red potato. For the upcoming movie Burnt (opening this Friday October 30, 2015), Castello wants to send one of you readers the below prize pack consisting of a bottle of olive oil, brie cheese, coupon vouchers, recipe ideas and a great escape movie pass to watch the movie Burnt. It will look just like the one below! 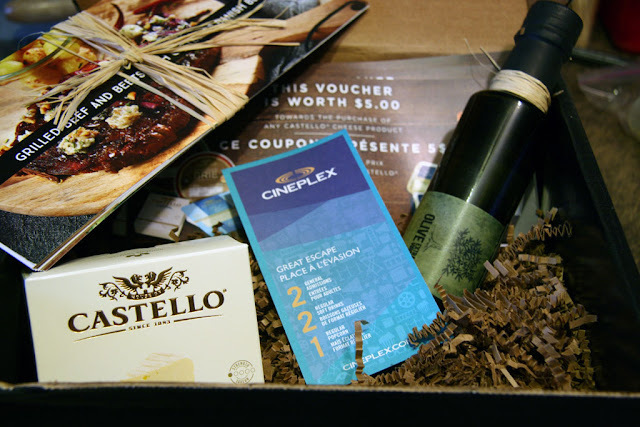 Movie passes for two (with regular popcorn and soft drinks), $20 Castello® Cheese Vouchers, Castello® Brie Cheese, a bottle of olive oil, and movie inspired recipe card. Mandatory Entry: To enter, write a comment about which recipe, other than the Hasselback Potatoes, from my recipe list you would like to make OR what types of other recipes you would like to see me blog about. Please leave a valid email address in the Rafflecopter widget as this is how I will be contacting you regarding details of the prize. You must leave a comment (in the disqus widget) matching your rafflecopter name or your entry will be disqualified. Winner must answer a skill testing question before receiving the prize. Sorry, this contest is only for Canadian residents. Visit and like my Facebook page - Beyond Umami. Like and share the giveaway post (+2). Come back here and leave a comment to let me know that you shared the giveaway post. Visit and like the Castello Canada Facebook Page (+1). Giveaway starts Wednesday October 28, 2015 and ends on Friday November 13, 2015. Totally trying the Hasselback Potatoes tonight with some homemade burgers. I will probably use Mozzerella cheese! I'd love to try your Savoury tomato and ham pie with a cheddar cheese crust. It's a cold day here, and this would be perfect. I am going to make the hasselback potatoes, I made then before but used only butter never though about cheese as well. Wow with cheese even better! Thanks! The hasselback potatoes lookin' good and I shall make some of them and besides trying it with just that cheese, might add some hamburger meat mixed with bacon bits and other stuff. Your step-by-step hummus looks delicious! Would like to make the hasselback potatoes and the hummus. I would love to make these potatoes! 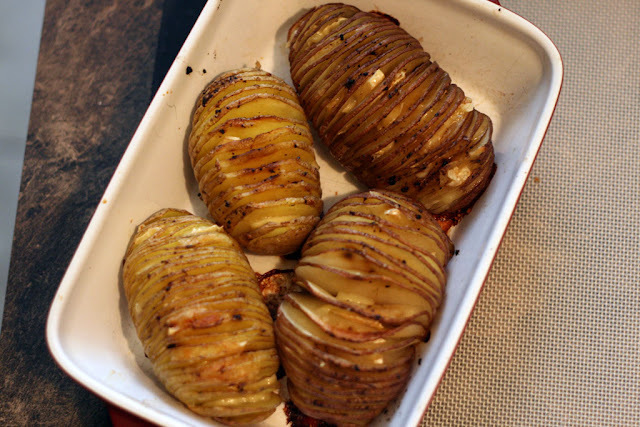 I would love to make the Hasselback Potatoes! 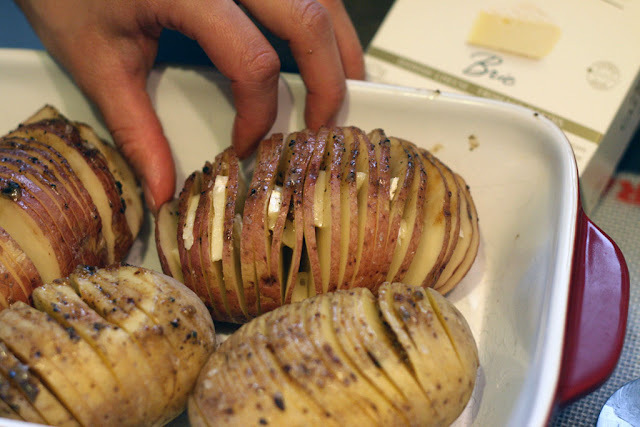 I really want to make those Hasselback Potatoes! I would like to try Step by Step Easy Hummus Dip. I am a huge hummus fan and that recipe looks easy enough for me to try! 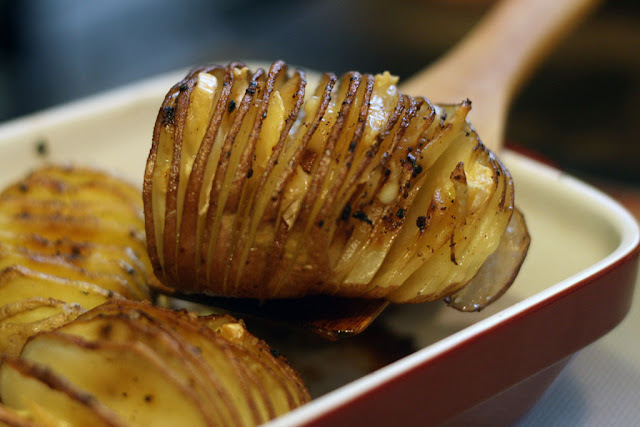 I love the look of those Hasselback potatoes! I will be trying them for sure! 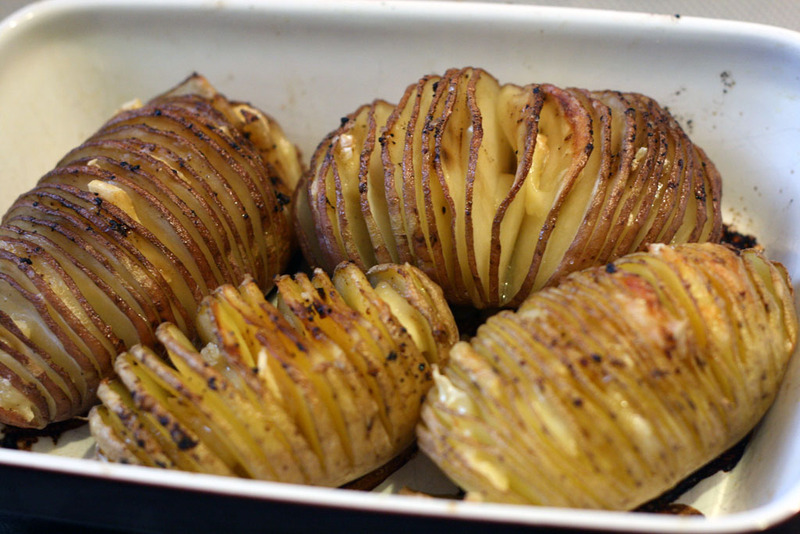 Hasselback Potatoes! They look AMAZING!! like to see more potato recipes!! I'd go for the hummus a personnal favourite! I'd love to try your Lemon Curd Macarons. I am a sucker for anything lemon. I would like to try the step-by-step hummus. You should create a recipe for poutine style mashed potatoes! I would love to try the Chai macarons. I've never made macarons before. I would love to try the Raspberry Balsamic Blue Cheese Hand Pies. I would love to try and make your Quinoa Chickpea Salad. Sounds delicious and I think my daughter would enjoy it! I would like to make the crust less quicke, love to see more wheat free recipes. The hummus recipe for sure! I really want to try your kimchi roasted cauliflower! I'd love to make the So Gouda! Artichoke dish. I love cheese, puns, and artichokes! Ummm . . . is there really any way to answer other than Creme Brulee ;) Thanks for hosting! I would suggest Hasselback Potatoes! The kimchi roasted cauliflower looks AMAZING! I'd love to try your Seaweed salad. My whole family would love this one I think. Kimchi roasted cauliflower sounds amazing! I can't ever get enough kimchi! I'd love to try your Kimchi Roasted Cauliflower recipe. We love kimchi at our house so I think we would love this recipe. I would say the kimchi roasted cauliflower. I would like to try the Quinoa Chickpea Salad recipe. I would love to try the hummus. I LOVE hummus, and have never made my own. I just recently got a food processor, and now I know what to use it for! I would love to try making your recipe for Easy Cranberry & Raisin Granola bars. They would be great for lunches! I've never made buttercream before. Would love to try the hummus recipe. I would like to see the Hummus Crusted Baked Chicken and any other recipes to use with hummus . 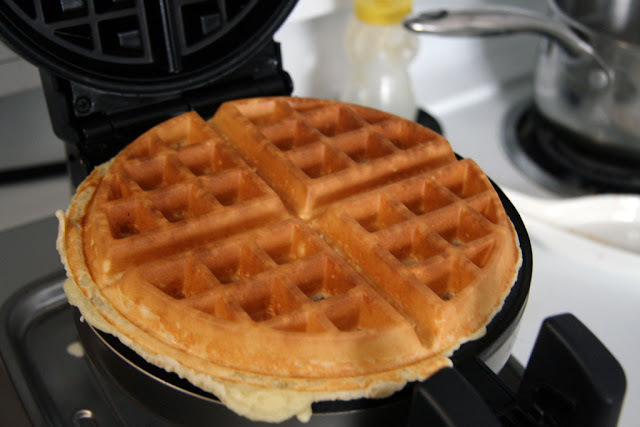 I am going to try your Belgium waffles recipe for our next supper club! I would love to try the hummus recipe. I would love to try making your kimchi roasted cauliflower! I'd like to try making the Easy Crustless Quiche Breakfast Recipe. 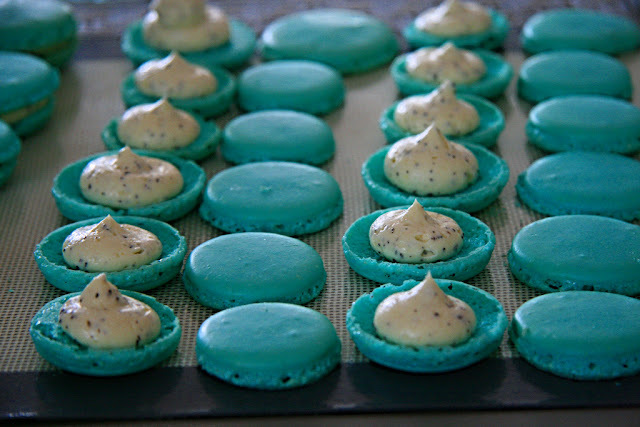 I would like to make the chai macarons. They look so good. I'd like to try your quiche breakfast recipe! We are heading into the perfect time of year to make your recipe of Homemade Candied Cranberries! What a pretty, festive little treat to put out for guests during the holiday season! Your Chai Macarons are calling my name! The Quinoa Chickpea Salad recipe! The Easy Cranberry & Raisin Granola bars! Yum! I'd like to try out the candied cranberries - Thanks for the recipe.. It will be great for the holidays!! I'd love some really good slow cooker or casserole recipes for hectic workdays. i would love to make your quinoa chick pea salad! it looks delicious! Would love to try out the Belgian waffles. Delicious Cinnamon Hazenut Rugelachs Recipe ..yum!! I'd love to try your Mac 'n Cheese Monday recipe! I'd like to make the amazing crepes recipe. Yes! that one is super popular and tasty! 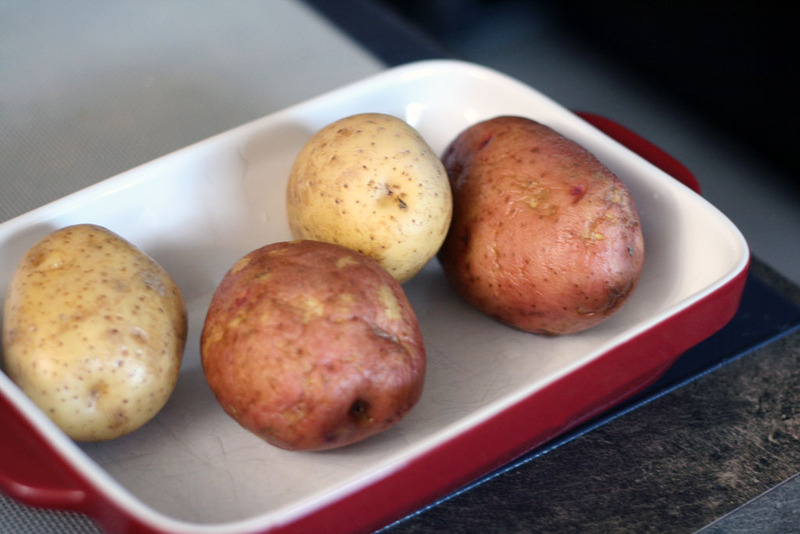 These potatoes have been great to serve as a quick meal for myself or even for guests. Feel free to use any type of cheese! there can never be too much cheese! Warm hot pie is always perfect for the cold days! Yes!! with cheese they are amazing! Feel free to use any type of cheese. Made them again and I used some nice sharp cheddar cheese stuffed inside and then grated more on top! Thanks for visiting my blog! Hi Elaine! Thanks for visiting my blog! Yes, that sounds so good! I think I'll have to try it myself too! They are a crowd pleaser for sure! thanks! It is so easy to make too! both are awesome choices. Sometimes I make the hummus as an appetizer for guests and the hasselback potatoes would be a great main or a side. Yes! Diane, try them out and let me know how it goes! Yes! definite another simple yet tasty appetizer dip! Great! glad to hear! Try it out and let me know how it goes! Yes! I do love how they fan out. If you try out the recipe, let me know how it went! Thanks Jeff! They sure are! Yes they really are! let me know how it goes and what cheese you end up making with them! awesome! glad to hear. Always glad to share a new recipe with my readers. I like how simple the recipe is. Actually, cauliflower is coming back as the new 'hit' veggie. Some people are even making cauliflower pizzas too! Thanks for entering the giveaway. Check out the other options to have more entries. Always glad to share a new recipe! If you try out the recipe let me know how it goes. awesome! Once you make hummus from scratch, you really can't go back to buying it anymore! :D let me know how it goes. Try out the crispy chicken recipe and let me know how it goes. The chicken stays juicy tender and yet you still have crispy chicken skin. great! if you do try it out! let me know how it goes! Kimchi cauliflower looks fun to make. Your hummus dip recipe look and sounds tasty. I've never tried making hummus, but i purchase it a lot so I really should give it a go!! I'd love to see more variations on the hummus recipe (like different flavours). Step by Step Easy Hummus Dip sounds pretty handy. awesome! I also find that it is great for snacks to bring to work or lunch. oh! That is an awesome suggestion! Yes! they are pretty good! @fossie55 they are delicious! good choice! @Erika Letson Yes that one is a great salad. Perfect as an appetizer, or to bring for lunches! @Erin When you do make it let me know how it goes for you or if you have any suggestions. @Jason Lafitte that recipe is a good one! I will try to blog more of the recipes we use again and again for dinner. @Shauna I LOVE creme brulee! Just needed to have one that would be a bit "healthier" good choice!! Thanks for stopping by and good luck! @Maggie Cheung Yup this is a good recipe for sure. Let me know what type of cheese you end up making with yours! Yeah! You don't even have to make your own kimchi. We usually buy a tub of it from a mom & pop place that makes kimchi all the time. Kimchi fried rice is so good too! @Jenn Erin L Perfect! Kimchi has so many different uses. We usually keep a tub of it at the back of our fridge so we can not only make the cauliflower but also kimchi fried rice, kimchi grilled cheese and more! great choice! Try it out and come back to let me know! Yes! I love making this particular salad for potlucks and also making a big bowl of it and using it as lunch throughout the week. @BethanyM It truely is! Also you can freeze part of the batch if you don't want to use it all up right away! @aly3360 It is super tasty. I honestly find that now that I have made it myself there really is no reason to buy it anymore! Plus, if you make a batch you can always freeze half of it to have another day. I can certainly look for more flavour options. there is one that I LOVE at the farmers market and end up buying. However, I am thinking I could really make it myself too :) Will blog it and let you know. Just subscribe to my mailing list to get notified when I do. We love our waffles at our place. Sometimes we make a triple batch and freeze them for future breakfasts and desserts! @Melp Thanks for stopping by and sharing :) come back again for more recipes. They freeze well too! Or you can crumble them up and add them to your breakfasts. one of my own go-to dishes too! They really are :) make lots of them and freeze so you can have make ahead waffles for breakfasts, brunches and dessert for days!!! That's exactly what I am going to do! My daughter got me on a quinoa kick..and it's just getting revved up! That one is a keeper for sure. Freeze half the batch if you can't finish it all too. Yes for sure! if you need more help check out my posts here for tips & tricks to get started. they are delicious! here's a post to help you get started on making macarons.